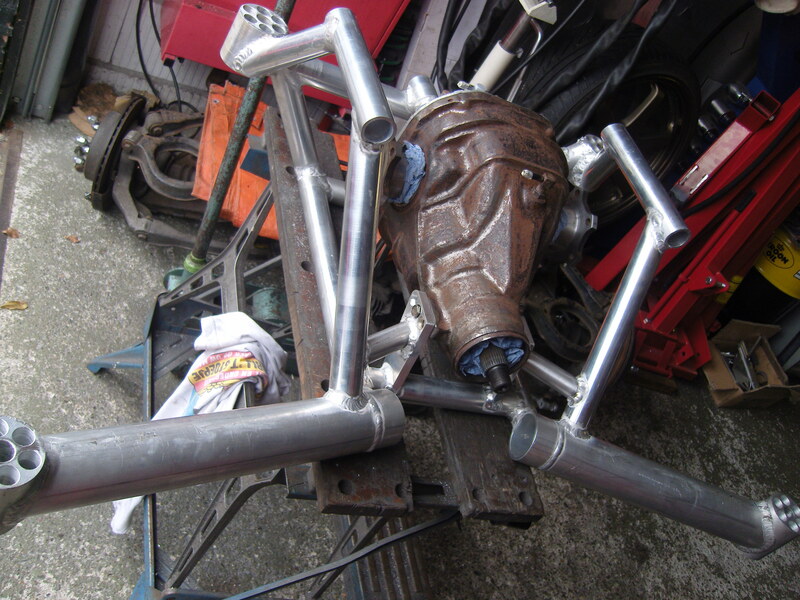 Like the knuckles and everything attaching to it, I wanted to make the new subframe as light as possible. The choice of material came down to aluminium 6082 or 25crmo4 tubing. 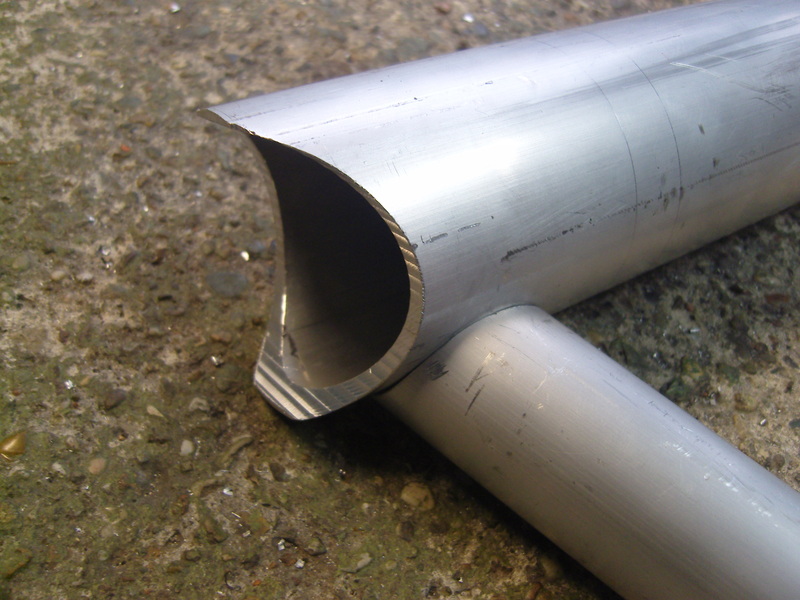 The 25crmo4 (chromoly) is considerably stronger for the same thickness, but it’s well over twice as heavy. One of my demands for the subframe was the ability to attach numerous fixings to it, and have replaceable mounting points for the control arms. 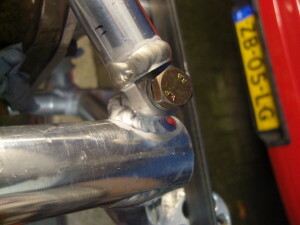 For a chromoly frame, these fixings can be made from the cheaper, more common 42crmo4, but as there’s well over 20 of them, the weight will increase over an aluminium subframe. 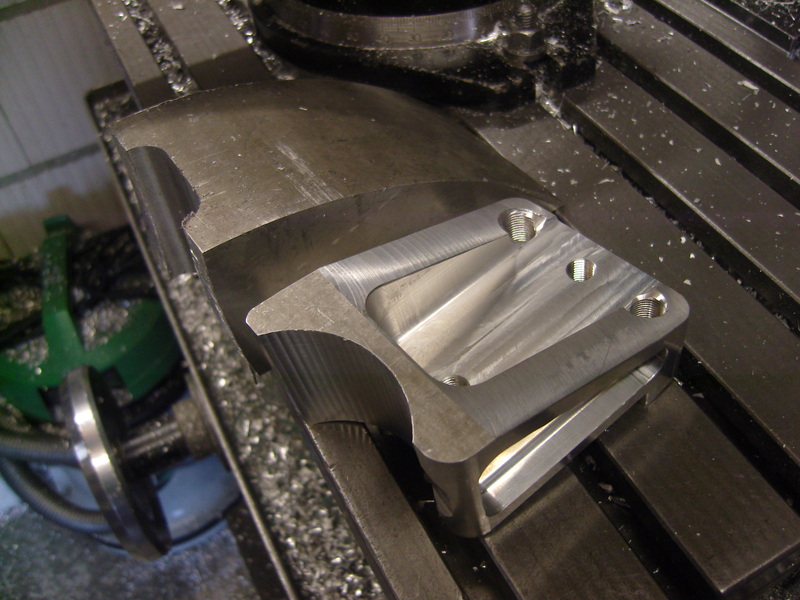 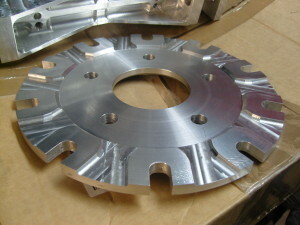 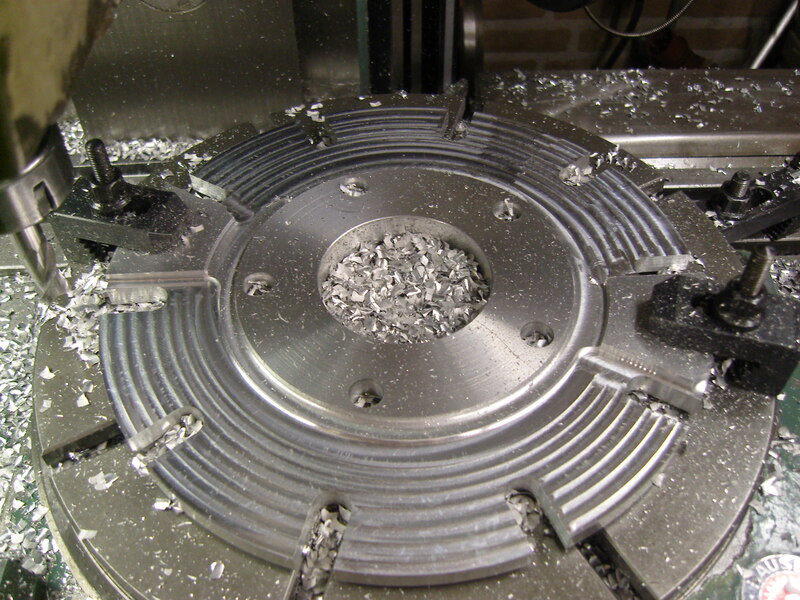 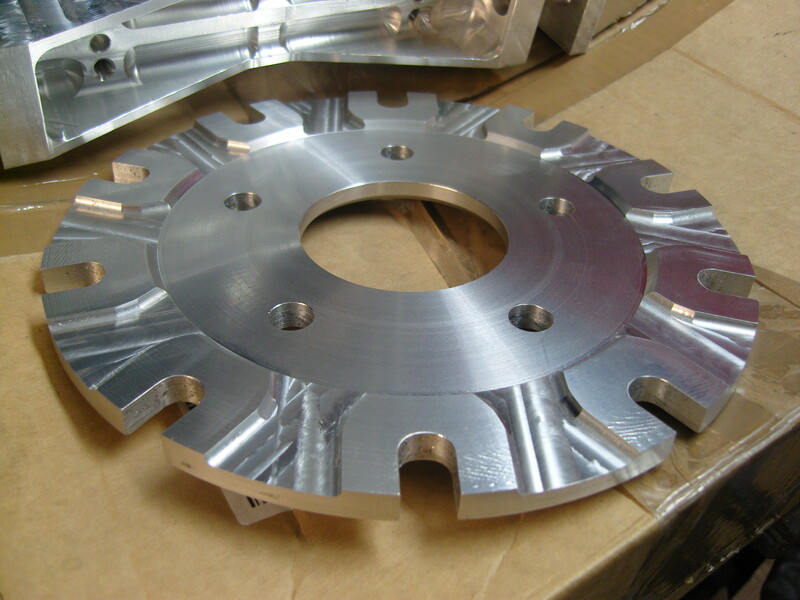 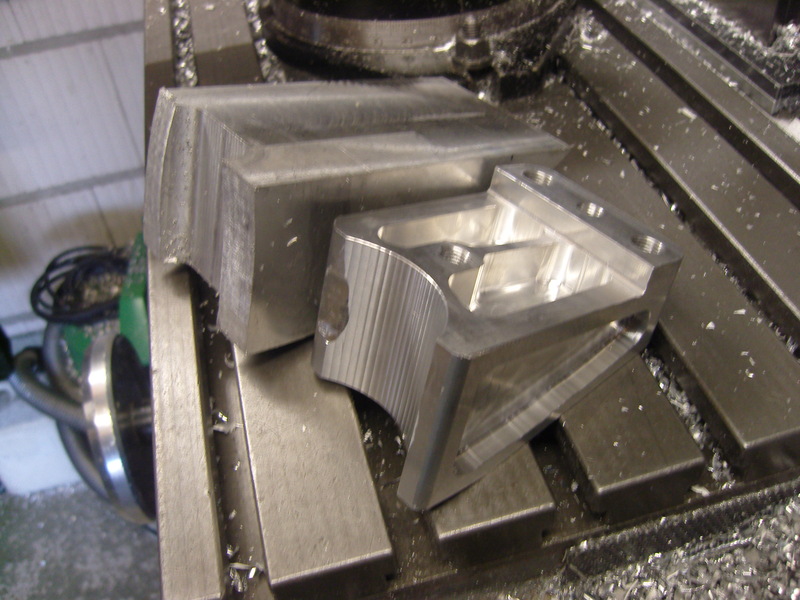 With 6082, the subframe can be made strong enough, and also much easier to machine mounting points for. 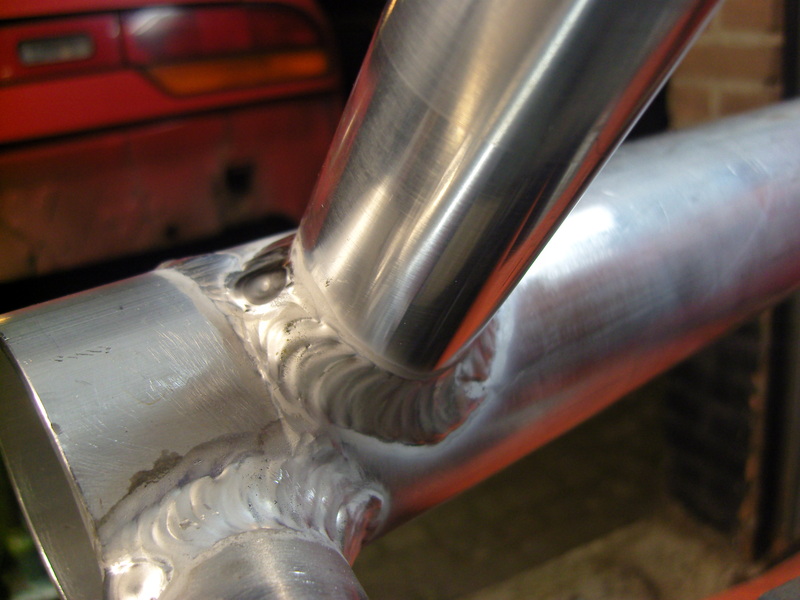 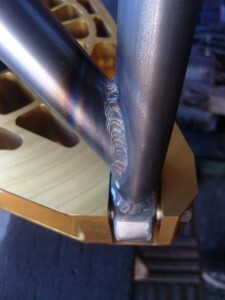 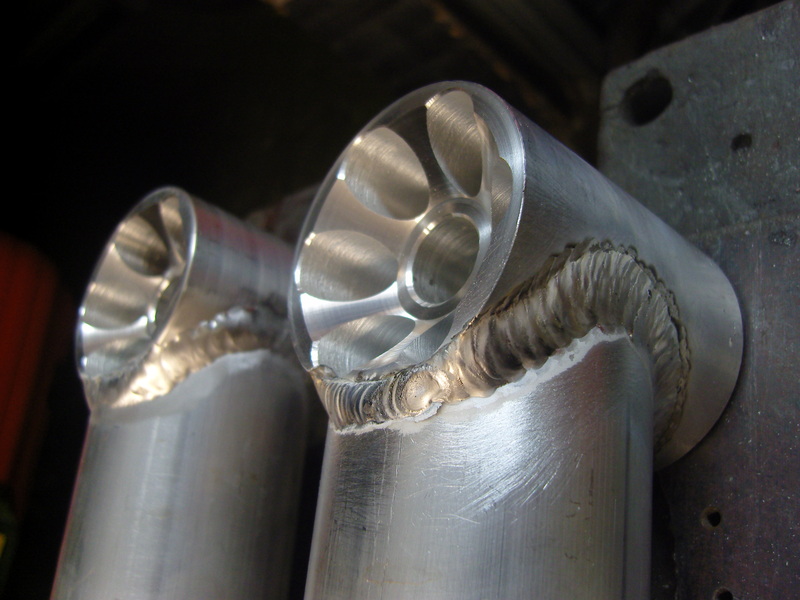 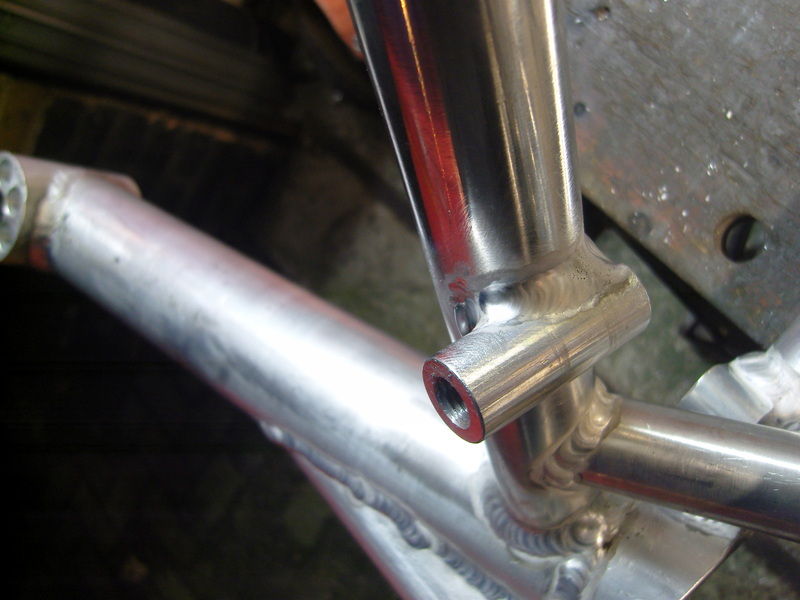 Welding chromoly – in particular 25crmo4 – requires perfect fits, as contaminated welds develop cracks. 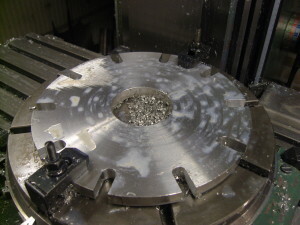 But getting that perfect fit is more difficult as I’m limited to manual machinery. ‘Filling a gap’ on a relatively loose fit with aluminium is not much of a problem. 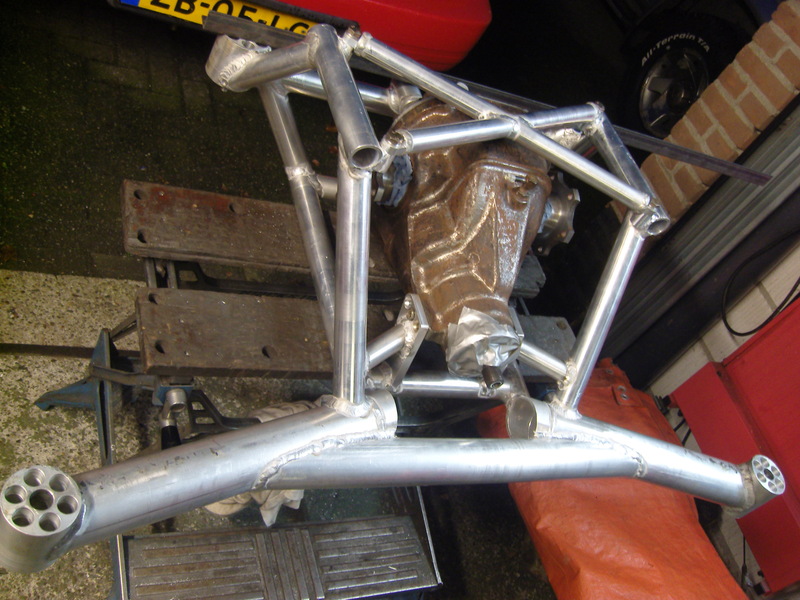 So in the end, based on my construction/production capabilities, the subframe was made in 6082. 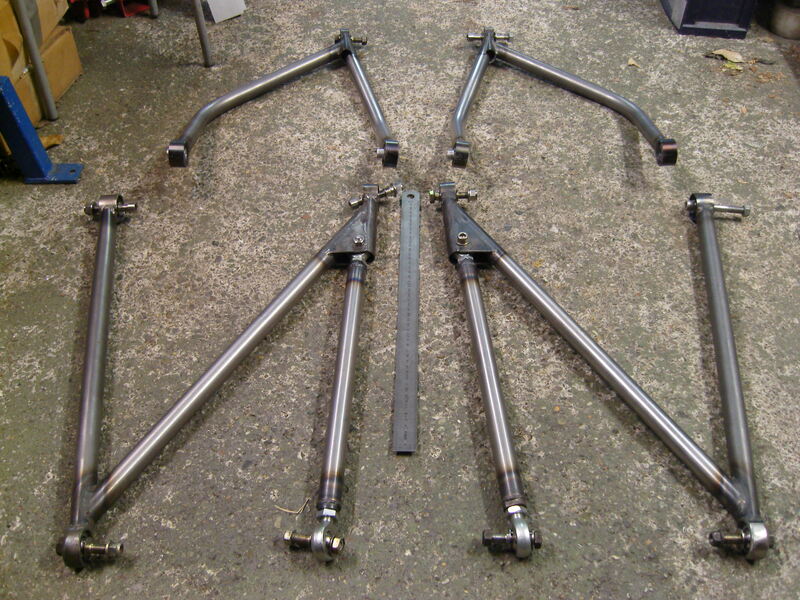 The designing of the subframe went along with the control arms, I’ll start with the subframe first. 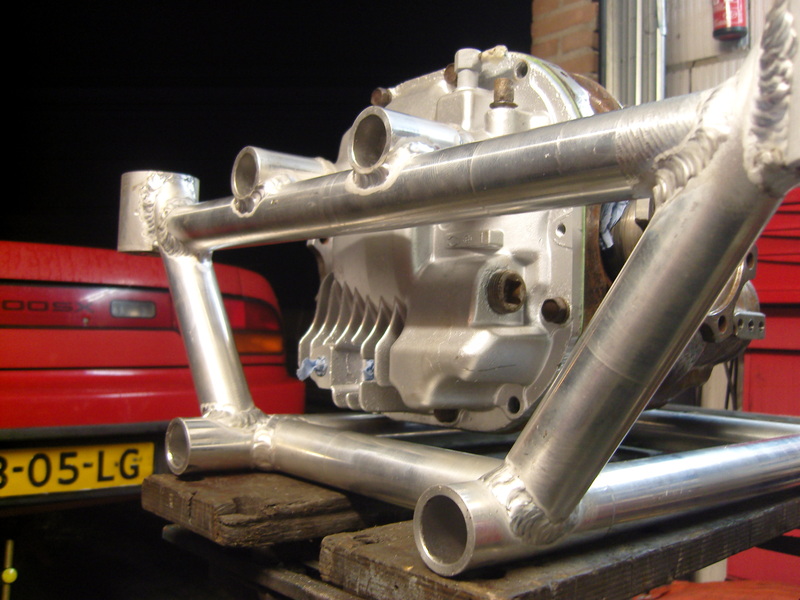 The factory subframe mounting points in the S13 chassis are 4 20mm thick studs. 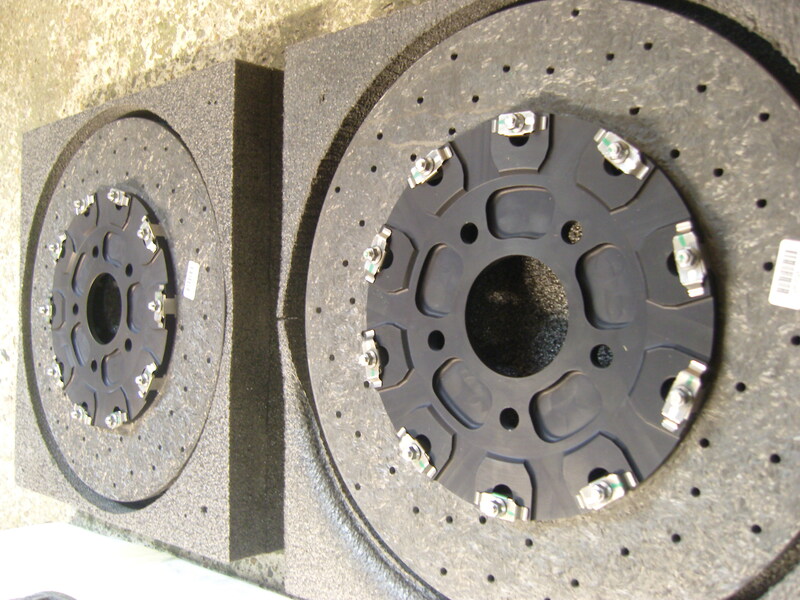 Additional mounting points were made right above the differential and at the factory rear seatbelt catcher points. 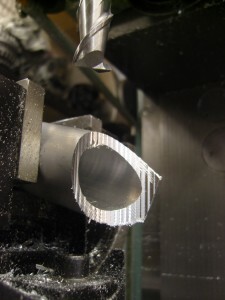 By calculating the angles at which the tubes fit, I was able to make flush fittings for the primary tubing with the milling machine. The primary tubing used is 50x5mm and 80x5mm. 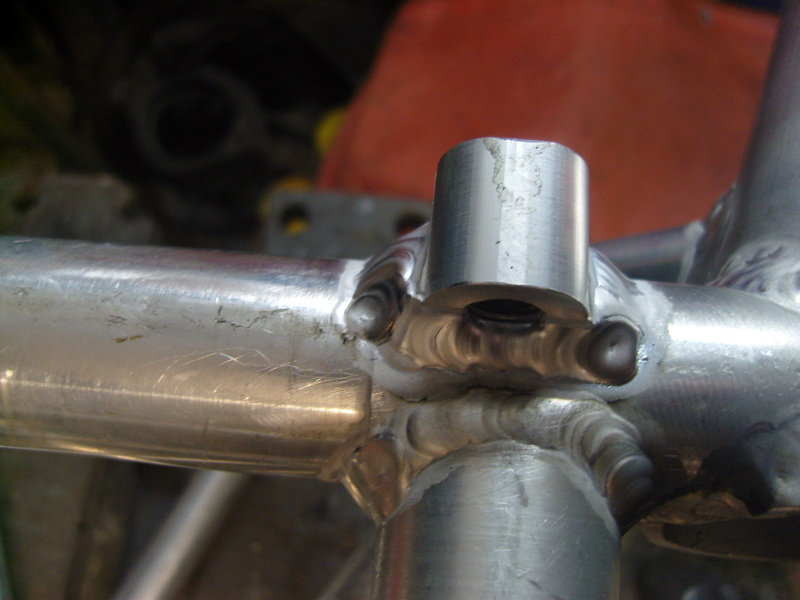 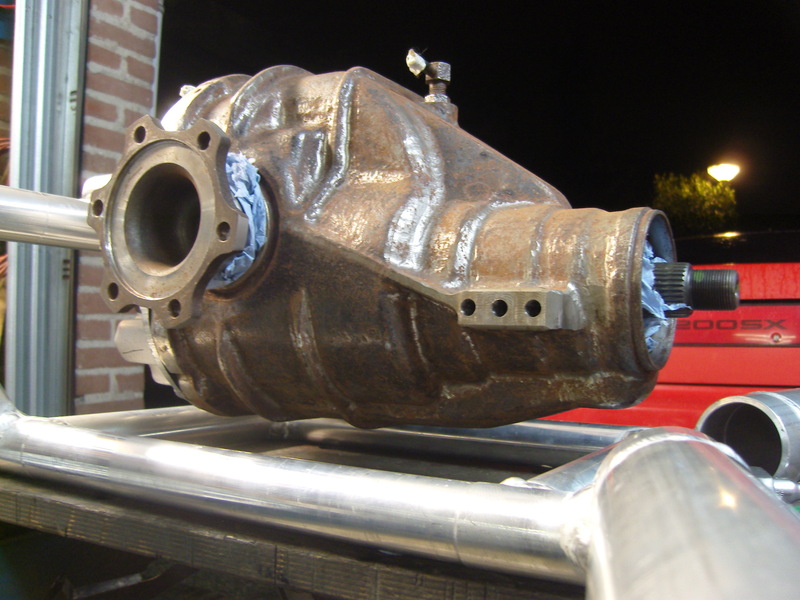 The pictures with the differential holding on display how strong the aluminium fittings are. The 40kg+ differential is only supported at the rear, yet the frame does not bend through at all. 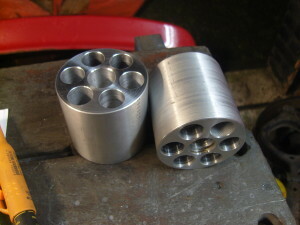 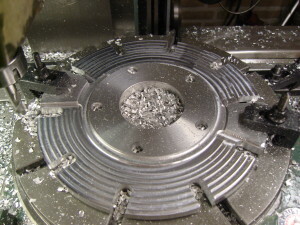 Several tubes were cut down 1-2mm on the lathe where forces are less demanding. 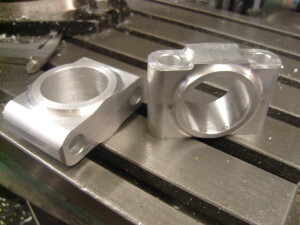 The differential mounting brackets and the rear upper arm brackets would have been very difficult to (manually) machine in chromoly. 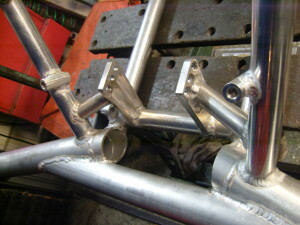 The rear upper arm units will also serve as a mount for the anti-roll bar. As can be seen in the above pictures, the mounting points for the control arms are not brackets but flanges, with 2 M12x1,25mm threaded holes spaced 55mm apart. 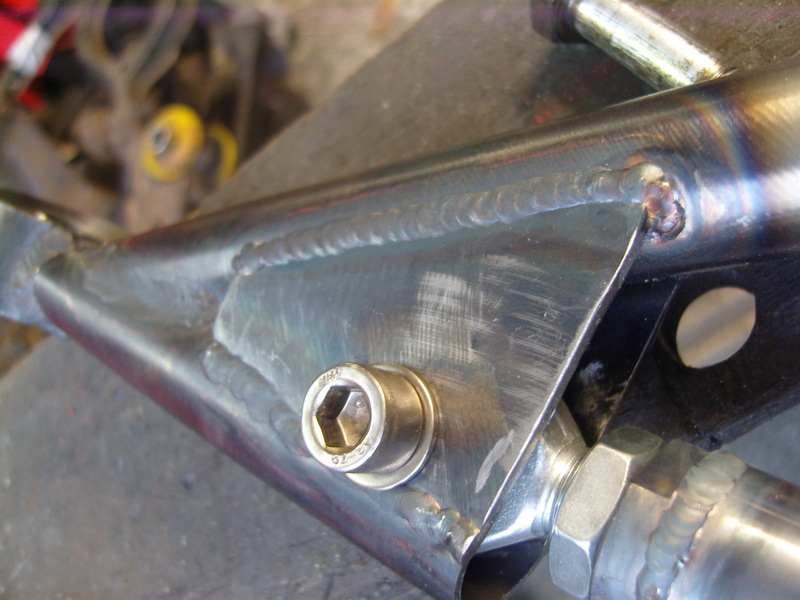 Up against these flanges U shaped brackets are bolted. 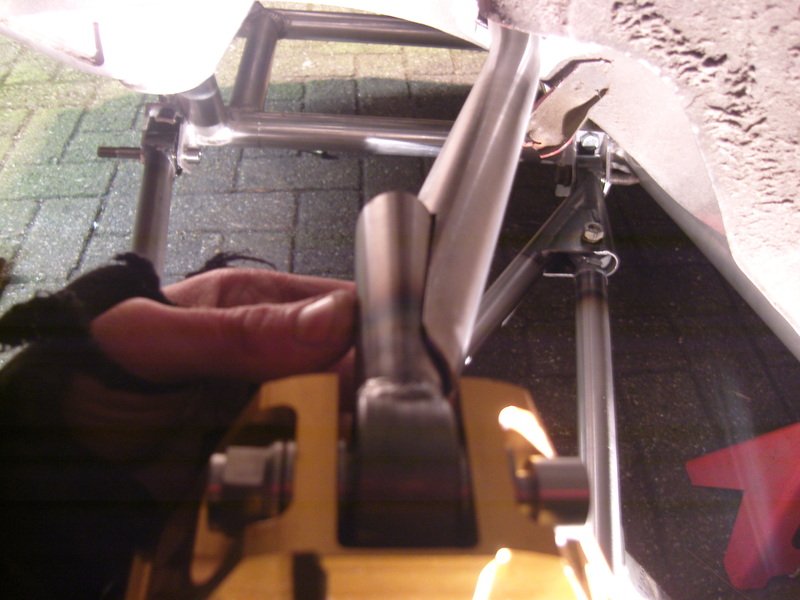 By using these U brackets (that can be made in any size to alter the mounting location) large adjustments can be made to the control arm angles. 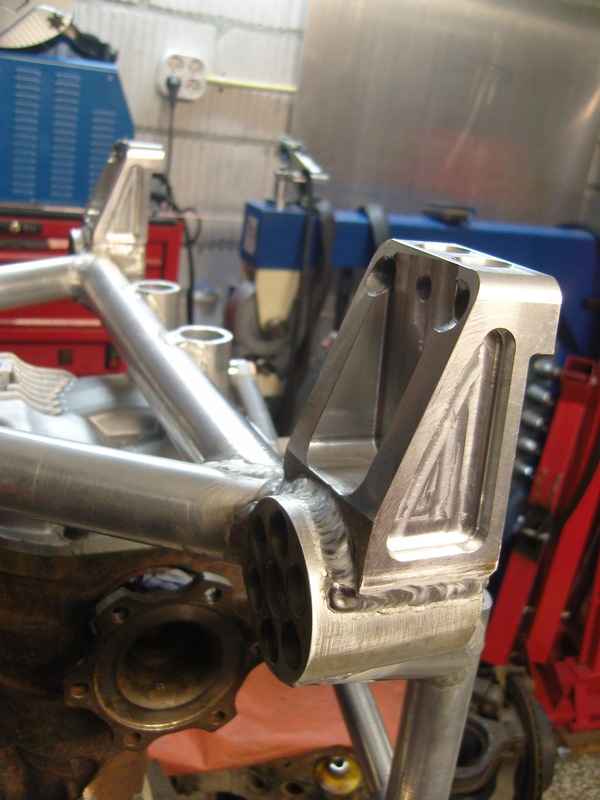 They will also bend on crash impact to save the subframe and knuckles. On page 5 of this project a couple of pictures show these brackets. 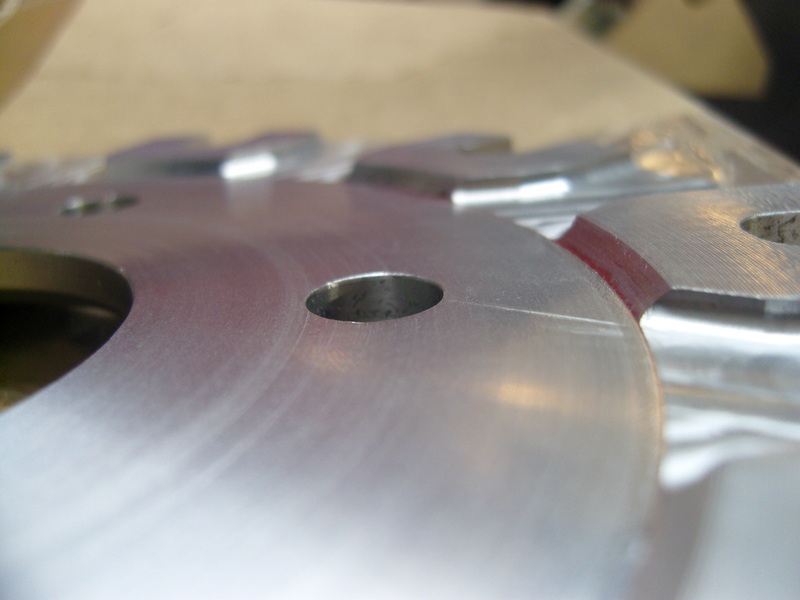 The X shaped upper section is removeable to facilitate removal of the differential. 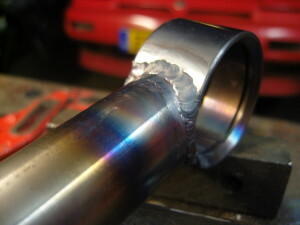 For the control arms, using 25crmo4 was a matter of course. Aluminium control arms may not be welded, as they will crack from the agressive loads and shocks put on them. The lower arm where the coilover will attach to is 30x2mm thick, the other sections rate from 30×1,5mm to 30×1,2mm. 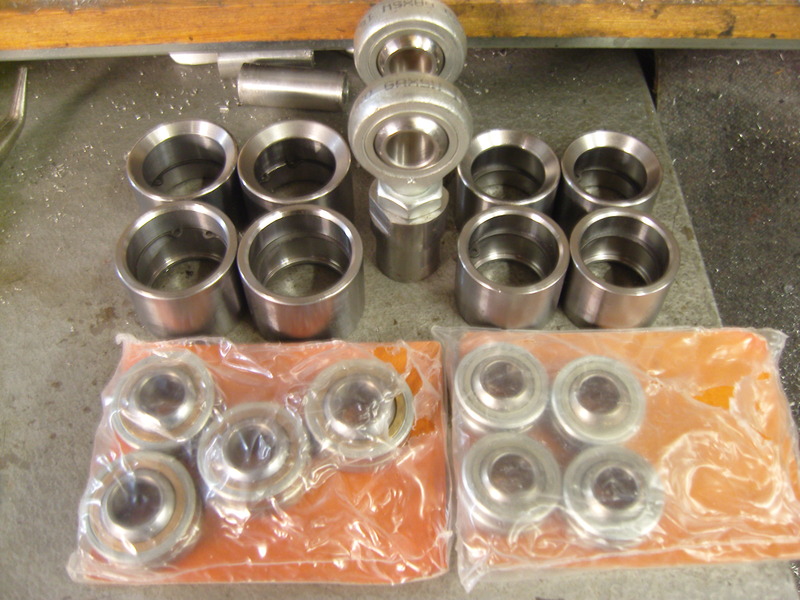 The spherical joints that replace rubber bushings are pressed into weld-on cups. 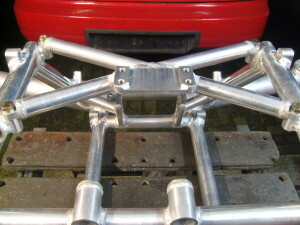 This leaves the control arms as a 1 piece unit, of which the length can only be adjusted through means of the adjustable U brackets on the subframe. The toe arm however is fitted with adjustable spherical bearings, known as rod ends. Rod ends are ruled out for the other joints though. 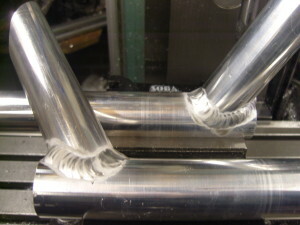 The toe arm only sees load in longitude direction, but the lateral load transfer on the other arms may cause the rod end to break. 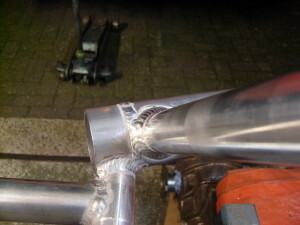 A good link to an article discussing this; Rod ends in bending. 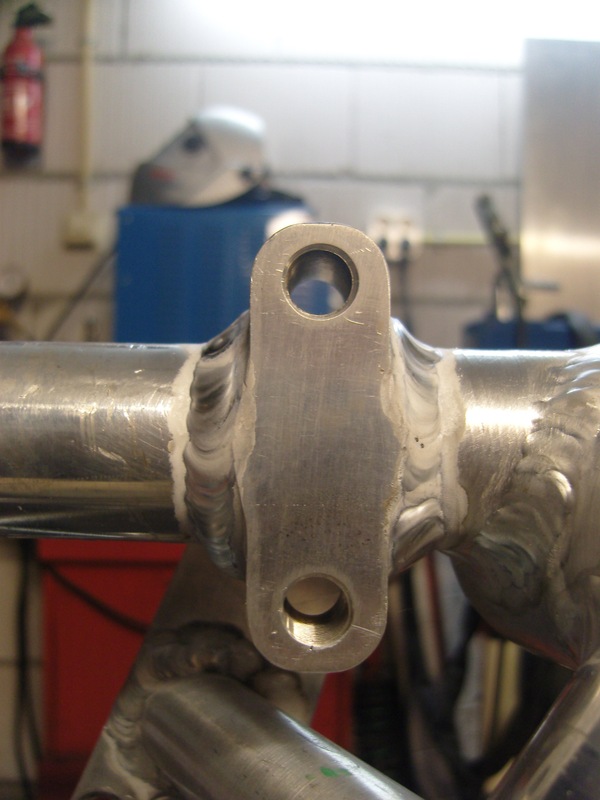 I studied the use of oval shaped control arms (common in racing for decades), which have an aerodynamic advantage and if properly designed higher strength to weight ratio. However, oval arms would severely complicate the design of the arms since I designed the knuckles with horizontal joint fittings. The weight advantage would only be gained if I had the material for making them, which I don’t. And despite their length, the combined upper and lower control arms weigh as much as the combined factory control arms. 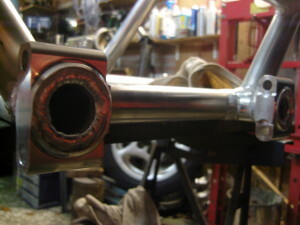 This largely due to the ineffective design of the factory arms, being made from thick stamped metal instead of thin chromoly tubing. The rear brakes are Ferrari California discs with Nissan R35 GTR calipers. 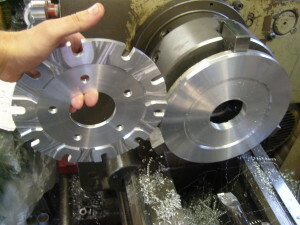 The disc bells were made from 7075 aluminium, and the complete disc (360x34mm) assembly weighs less than the thin factory steel disc. Of particular importance is the clearance to allow the disc to ‘float’ within the bell through the mounting sleeves. 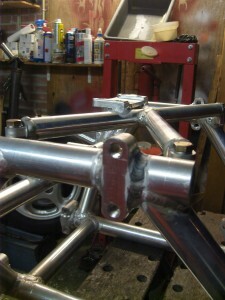 The bells are hard anodized black.